NOTE FROM DECEMBER 2018 TO JAN. 2019 - One week booking min. 2 night min stay for all other rentals. Nestled on 117 acres of rolling native country, unfolds your very own sanctuary. The outlook and position of this magnificent home makes it a perfect property for all seasons. In Summer you can enjoy the al fresco dining or the deck area. 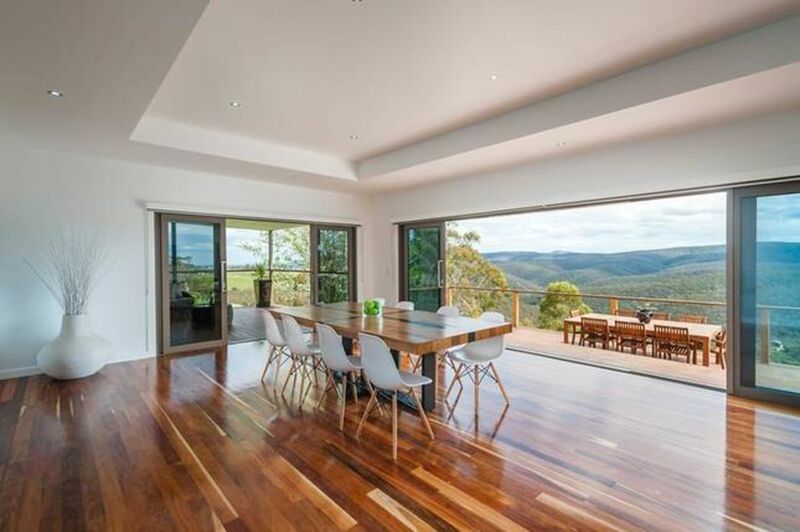 With an elevated view over the State Forest, it is the perfect setting for long lunches or dinner parties. Alternatively you can enjoy a picnic in the spacious gardens, croquet on the lawns, or find a quiet place to read a book. There is also a dedicated children's play area out side. The Interior is an open plan kitchen built for entertaining, with SMEG appliances. Split system heating/cooling provides you with cozy winter nights or cool climate during the warmer weather. The property has 52 squares of contemporary living featuring 4 bedrooms, 2 bathrooms, study, 2 living spaces and powder room. The beds provided include 1 King bed, 1 Double bed, 1 Queen bed and 2 Single beds. The property has four stylishly appointed bedrooms. The bedroom has a distinctive colour scheme, with beautiful linen and upholstered bed heads. Only 50 minutes from Melbourne, enjoy bushwalking, trail bike riding and four wheel driving. Sit back on the open alfresco entertaining area watching the sunset with a wine in hand. Home to kangaroos, wallabies, wombats and deer, there is also 35 acres pasture. With views of the state forest, this is modern living at its finest. There is no smoking on the property and no pets are allowed. All linen and towel is supplied as well as tea, coffee, biscuits, oil, vinegar salt & pepper. Choices of indoor entertainment include a range of DVD’s, board games, books and magazines. Unless there is another booking arriving on the day you check out, a late check out may be arranged. We hope you enjoy and your experience! Ten of us had a lovely getaway from the city in a modern place with fantastic vistas of the countryside. Lots of bush land nearby to explore and enjoy. Property had everything we required for a relaxing and comfortable weekend. Amazing deck for taking in the sunset and having meals on. No complaints at all. Beautiful home in a great location, central to lots of attractions, with great facilities. We had our whole family stay, 7 adults and two children. It didn’t feel crowded or cramped. There was lots of things to explore locally and we never felt bored or lost for things to do. The view was sensational and kangaroo spotting was a highlight. It was very kid friendly and the house had great accessibility. Few technical issues with the media room, but otherwise sensational facilities. Lovely kitchen to prepare meals as a family and lovely large dining spaces to share those meals together. Would highly recommend this house as a family holiday destination. My mother in law had an amazing 70th birthday celebration. We loved our stay! The house is beautiful and the view is amazing. Only downfall i could say was that the bbq was not set up and there was no wifi, other than that the weekend was great.